First you’re thinking…why so long?! That’s on purpose. I want them working on something right away so I can take attendance, deal with any placement issues and take their pictures (more on that later!) while they’re busy working. I want to send the message from the very start that there is no time for downtime in Spanish Class. A few things: First of all, there’s a place to mark their gender. I’ve had a few students who don’t identify as male or female , and that’s why there is room to write something different if that applies. Students write their name and class period with a marker in the box…meanwhile I’m using my phone to circulate and snap pictures of everyone holding up their name tag. I had a brilliant professor in in graduate school that did this to learn our names and then I read Martina Bex’s blog post about using pictures to learn their names so I thought I would give it a try. You guys…THIS IS A GAME CHANGER! I’m really awful at learning names and it used to take me 2 or 3 weeks to learn everyone’. I totally relied on name tents on their desks. But when we went deskless, I panicked….where would their name tent go?! How on earth would I learn 180 names without name tents?! So I figured I would just have to learn everyone’s name much quicker: Now I take their picture on ay 1, study the pictures that evening, review them before the next class and I’ve got their names (98%) down by the 2nd day of class. Something magical happens when you greet students on the 2nd day of class by name. It’s cool. They’re amazed. It sets a great tone. Try it. Trust me on this one. (Disclaimer: this hack only works if you actually do your homework and study their pictures!) I find it’s fastest to take pictures of 2 students at a time (since they’re seated in pairs) and make sure that their name tag is visible in the photo. While I’m taking pictures, students are working on the front side of the student interest survey and continue onto the back if there is time. The backside of the sheet, “5 most important things about you” is for the early finishers but reveals great information, things like “I am color blind, I can’t read green markers on the board” or “I can’t hear out of my left ear so please seat me on the right side of the classroom”. I don’t worry if kids don’t have time to finish (or start it) as long as they complete the first page. When it’s time to pass them in, I’ll teach them our Paper Passing Procedures (Say that 10 times fast!) and they’ll pass them in and I’ll file them in my Student Info Binder. 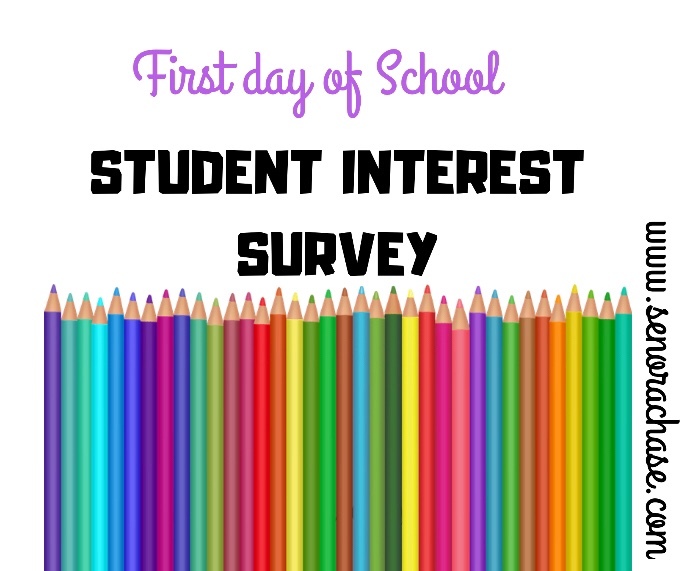 This Student Interest Survey is specifically for Spanish 1. The only addition I make for my other levels is to ask who their previous Spanish teacher was and what grade they got. I like I know where they came from the previous year (by the teacher’s name I know if it was a CI or Traditional classroom) and I like to know their grade because there is a C or higher prerequisite for levels 2+. Yes, prayers to you and your grandma. Gracias! Your procedures will help me as I transition to CI this year.